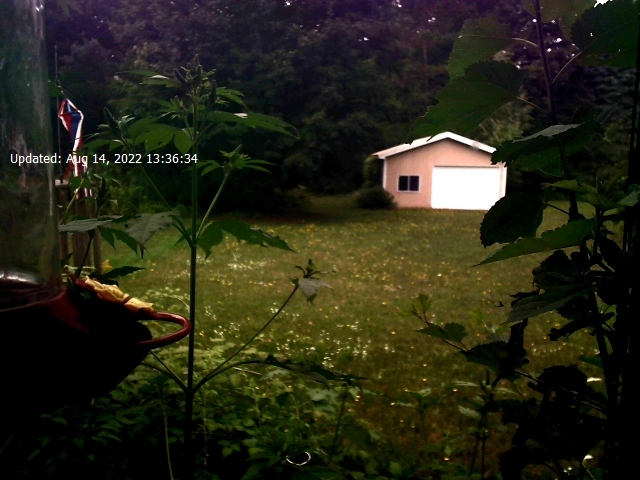 This is the live web cam shot of my backyard on Intermediate Lake Road in Central Lake. In winter I have a snow depth gauge installed. To view road conditions, you can click the Bellaire Street Cam, Eastport Road Cam, and Streaming Webcams buttons on the right. The picture is updated every five seconds during daylight hours until I turn the camera off around sunset. You can email me with any questions or comments. (4/18/19) We had quite a bit of rain last night, which was accompanied by thunder and lightning. Our next rain is expected late this weekend. I've added a hummingbird migration map button between the School Closings and Wind Chill buttons. This is a new site, where you can zoom in on each location and click on the dot to see details. As of April 6th, the birds have reached Kentucky. I expect to be adding my first sighting in early May. (4/11/19) Click on the thumbnail to see a couple of late winter pictures of a welcome Northern cardinal and Downy woodpecker and some unwelcome European starlings. (2/26/19) After the blizzard of the past couple of days, we have calm winds and blue skies. Click to enlarge. (2/22/19) Here are the tracks of snowmobiles entering the lake across from the Corner Store. Click on the thumbnail to enlarge. (2/22/19) We're having a brief warm spell with temperatures approaching 40° this weekend. Night temperatures are expected to return to below zero in another week or so. Click here to see changes over the seasons.